On the road, unfortunately, so this will be my first attempt to put a post up entirely from my iPhone. The stock market can give you early warning that your job is in trouble. I’m not just saying check your company stock… clearly, if your company, like Lehman, goes totally belly up, yeah, your job is toast. I’m saying, keeping an eye on the market in general. If you paid attention at all this summer, you knew that the banking industry was in trouble. Bank stocks have been down as much as 90% this year. 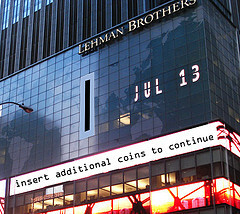 And last week’s 80-something percent drop in Lehman should have alerted all Lehman workers than things were dicey. If you’re at a publicly traded company, the market can tell you things have turned sour even quicker than pink slips can be produced and cost cutting can begin. Hope I’m wrong, but look out WaMu and AIG folks! I could have told you that two years ago! With the real estate issues I am waiting for the other shoe to drop – credit! We are in for a VERY bumpy ride! Let’s hope that some of the major countries don’t view the US dollar as an albatross around their neck and unpeg from the US currency! Then we WILL be without a paddle!